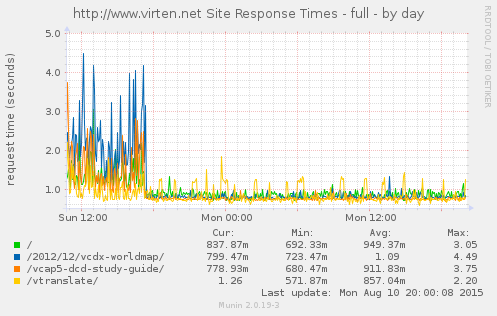 Last sunday I've migrated virten.net from Apache to nginx. I've used Apache as Webserver since I can remember but in the last month it has become slower and slower. The blog is running on a dedicated server and delivers about 1 million pages and 8 million requests in total per month (including bots, crawlers and spiders). This huge load was too much for my apache and it started to delay the delivery of pages. After some weeks of background testing, I switched the DNS to the new host yesterday at about 17:00. If you've encountered any issues, please do not hestitate to contact me. As you can see from the graph, the total page load time has been significantly reduced, and while the first day is almost up, I haven't seen any issues. That's really incredible how NGINX works faster than Apache. Unfortunately, the good old one Apache should be rewritten from scratch. 16 GIG and no Problems, maybe your wordpress install very crap?